Kim Clijsters intended to celebrate her ascent back to number one attained this week in reaching the semifinals at the GDF Suez Open by taking the title. In the two prior meetings against Petra Kvitova, Clijsters dismissed the Czech 6-1,6-1 and 6-3,6-0. Thus, it was safe to say that Clijsters held all the cards. On this occasion, Kvitova reversed their roles and did the bullying. Kvitova trumped Clijsters 6-4,6-3 to collect her second title this season. In the second round, Kvitova salvaged match point to advance and wiped out a 3-5 third set deficit in the quarterfinals. From the initial game, the confident Czech demonstrated she meant business. With a backhand up the line winner, Kvitova had break point. She converted thanks to a net court winner. However, Clijsters quickly rebounded by stealing the next game. Still, Kvitova was relentless forcing Clijsters to survive another break point before guarding serve for 2-1. Following an easy service game, Kvitova earned double break point when Clijsters’ forehand traveled long. On her second opportunity, Kvitova connected with a forehand return winner to bag the break for 3-2. Then, with three forehand winners, Kvitova consolidated with a love game. With her serve grooving, Kvitova rolled the rest of the set and with another love game served it out. To open the second set, Kvitova crushed a forehand return crosscourt winner to obtain break point and later captured the game. Yet, despite having two game points, as in the previous set, Kvitova failed to maintain serve. This could have marked the time when the 20 year Czech’s crumbling started as Clijsters began to serve more effectively. Instead, Kvitova confirmed her resoluteness to completing the task at hand. After saving a 30 all game which included a double fault, Kvitova continued to use her bludgeoning strokes to put Clijsters on the defensive. Subsequent to double faulting which gave Kvitova break point, Clijsters provoked a backhand crosscourt error to get to deuce. But, by pressuring Clijsters into a forehand mistake, Kvitova secured her third break point of the game and gained the advantage when Clijsters pushed a forehand swing volley into the net. With an ace, Kvitova sealed her service game for 5-3. Serving to extend the match, Clijsters sent a backhand long to hand Kvitova championship point. However, with an ace, Clijsters got back to deuce. Next though, Kvitova pulverized a backhand causing Clijsters to lob her forehand long. Thus, Kvitova had her second match point. This time with a forehand crosscourt winner, Kvitova claimed the title, the third of her career. Venus Williams has been turned away her last three finals while Victoria Azarenka has prevailed in three consecutive finals. In the 10th edition of the Dubai Tennis Championships, third seed and defending champion Venus met fourth seed Victoria for the ultimate match. Williams came out on top 6-3, 7-5 for her 42nd WTA career title. Williams had been supreme this week, winning all her matches in straight sets. 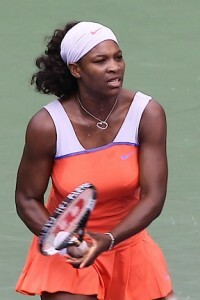 In the quarters, Williams defeated Anastasia Pavlyuchenkova who had beaten her two times in a row. From the first game, Williams was impressive with a forehand crosscourt winner for 40-0. Serving at one all, Venus crushed a backhand down the line pass to hold for 2-1. After a love game for 3-2, Williams forced Azarenka into two forehand errors for double break point. Venus was gifted a double fault for 4-2. However, serving for the set at 5-3, Venus committed two double faults. 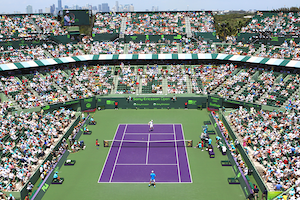 Then, with a forehand crosscourt winner by Azarenka, Williams faced break point. Yet again, Williams rifled some big serves to bail herself out, thereby carrying the set. Still on the attack, Venus provoked Victoria into a couple of backhand miscues for double break point to open the second set. Williams captured the break when Azarenka made her third consecutive backhand mistake. With a couple of forehand winners, Venus easily took the next game. Serving at 0-2, Azarenka missed a lob and went down 15-30. Under pressure, Azarenka produced a couple of forehand winners to maintain a single break deficit. With Williams consistent on the forehand side, Azarenka could make no headway. But, Victoria’s opportunity finally arrived at 2-3 when Venus muffed a couple of strokes squandering two game points. Afterwards, Williams double faulted giving Azarenka break point. Victoria cashed in when Venus’ forehand sailed long. The next game, despite Azarenka’s first serve letting her down, she held for 4-3. The following few games, each woman guarded serve without complication. However, at 5 all, Azarenka found danger. By Venus chasing down every ball, Azarenka’s backhand coughed up errors leading to double break point. With a forehand up the line winner, Williams grabbed a 6-5 edge. After Azarenka saved two match points, Williams had a third with an Azarenka backhand miscue. With two net courts in the same rally going in Venus’ favor, she sealed the title when Victoria dumped a volley into the net.